Versatile, precise MODELCRAFT* Tool Sets From SHESTO Offer Terrific Quality & Value– All In One Convenient Package! PTK1015 15-piece Craft & Model Tool Set. PSD1011 11-Piece Precision Swivel Top Screwdriver Set. 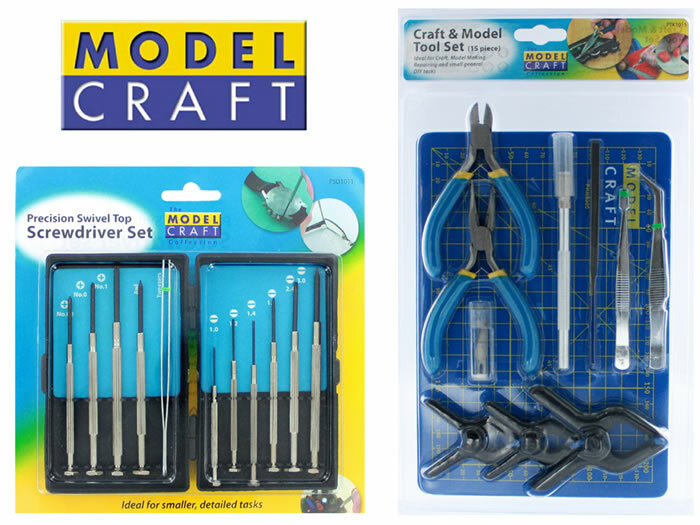 Other MODELCRAFT® Tool Sets include the economical PTK1009 9-Piece Plastic Modelling Tool Set, handy PTK1012 12-Piece Boat Building Tool Set, multipurpose PTK1013 13-Piece Model Rail Tool Set, versatile PTK1018 18-Piece General Purpose Tool Set , and all-inclusive PKN1050/CM 50-Piece Knife & Tool Set with FREE Cutting Mat – each of the last four with a handy, attractive metal storage & carrying case! For over a century, SHESTO LTD have led the world in quality tools for professionals and enthusiasts alike. In addition to its popular MODELCRAFT tools range, the company’s comprehensive lines of creative, precision products include SPRAYCRAFT, JEWELTOOL, LIGHTCRAFT, ROTACRAFT, and FOILART. SHESTO currently supply tools to over 60 countries worldwide. Thanks to Shesto for the information and images.